What Is a German Streusel vs. Crumb Topping? Most people are unclear on the difference between streusel and a crumb topping in German baking. Here is how they differ. American recipes calling for streusel most often give a recipe for what Germans would call a crumb topping, not a real streusel. A traditional German streusel (streusel means something "strewn or scattered" in German) bakes up into shortbread balls, for lack of a better description. It is crunchy and cookie-like on top and soft on the bottom where it meets the cake or fruit. Typical German streusel recipes call for a ratio of 1:1:2, sugar:butter:flour, or close to that. By contrast, American recipes often feature a 3:1:2 or even 3:3:1 ratio (sugar:butter:flour). In the 3:1:2 ratio, you will finish with a sandy-like topping that shakes off easily. While the 3:3:1 ratio will yield a crispy, lacy effect. As an illustration, take this recipe posted by King Arthur Flour for Cinnamon-Streusel Coffeecake. It is a good recipe, if sweet (another American thing). But it is definitely an example of what Germans would call a crumb topping, not a real streusel. On the other hand, this German sheet cake with quark has a real streusel (1:1:1.5 ratio of sugar: butter: flour by weight) and this russischer zupfkuchen has a clear 1:1:2 ratio (with a little cocoa thrown in). Use cold butter cut into cubes. Room-temperature or melted butter will cause the streusel to flatten out instead of remaining in chunks. Never use baking powder or baking soda in a streusel topping. All you need is all-purpose flour. White granulated sugar or brown sugar is the way to go. If desired, experiment by adding spices, raw chopped nuts, raw seeds, and a pinch of salt if you've used unsalted butter. Mix with your fingertips only until a chunky, crumbly mass forms. Never use the palms of your hands because the butter will soften too much. 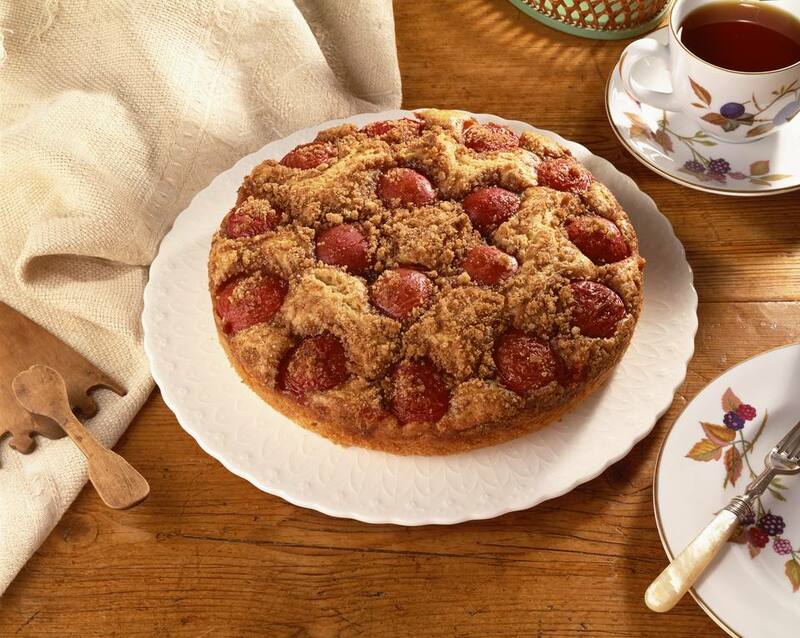 Streusel cake with cherries: This unusual coffee cake-pie hybrid can be made with fresh sweet or tart cherries or canned cherries. Pear torte: Seasonal pears are nestled in a custard held together with a nut crust and topped with a nut streusel. Sourdough coffeecake: If you happen to have a sourdough yeast starter bubbling away, use some of it to make this cake with a thick cinnamon streusel topping.